I don’t know anything about the history of dance. I took zero dance classes in high school or college. The last formal training I had was in fourth grade when my parents enrolled me in a Baile Folklórico class. At nine years old, I wore the traditional Mexican garb, boots and all, and did smooth tap and glide, brandishing a sombrero towards my partner. And then I stopped dancing, started writing, developed a laptop slouch. Still, I had a propensity for wild movement. In high school, I would stage absurd dance-offs, which I’ll here proclaim legendary. (Once, covered head-to-toe in a Winnie the Pooh costume, I went for it so hard in a Beyoncé dance-off that I vomited.) And then in college, a choreographer asked me to perform her experimental dance piece, which ended up being performed at the Kennedy Center. I approached the whole thing with a caution that eventually gave way to abandon. I don’t know what I’m doing, I would say. That’s why I wanted to worked with you, she’d say. Something I can do, apparently: commit to not knowing what I’m doing. 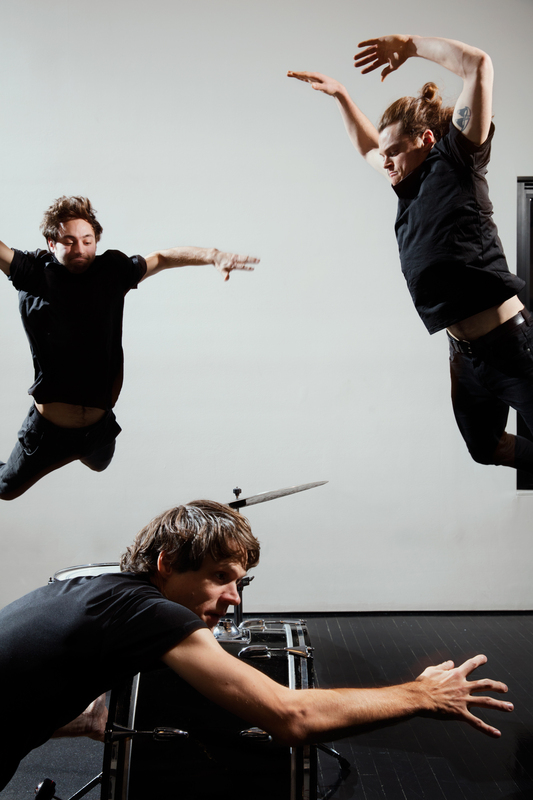 Matty Davis, Adrian Galvin, Greg Saunier in Repercussion. Photo by Jonno Rattman. For some reason, they took the bait. By this point, I had let myself go a little bit. (I have this habit of lifting up my shirt and staring at my belly fat and shaking my head.) I was broke, so of course my diet was Ramen and malt liquor. Meanwhile, Davis and Galvin are both incredibly fit, and have been since their days of extreme teen urban athleticism—rollerblading, skateboarding, you know, parkour wall-scaling stuff that I would only do if chased by a man with a chainsaw. But there was something so powerful about BOOMERANG that I wanted audiences to relate even more directly. And of course: who was more relatable to me than… me? My foolishness hit me when they asked me to come to Pittsburgh, Pennsylvania, to develop their new piece with them—one I’d perform in. Was I really doing this? Would I die? It was terrifying at first. They wanted me to throw steel anvils around, gorgeous circular sculptures that were the result of Davis flattening nails, with bare hands and a hammer, over and over and over again. We hurled the steel. I started bruising and scabbing instantly. And that was just the beginning of a process that became more and more extreme and scary—and eventually yielded to a bracing and surprisingly gentle performance. We’ve since performed For the toward in performance spaces and on a brutal asphalt slab in Grand Rapids, Michigan, under the BQE, at Tompkins Square Park, and at Transmitter Park as the sun set in a flood of pink. Matty Davis and Will Arbery in For the toward at ArtPrize 7. Photo by Erin Wilson. Instead of working tirelessly in an effort to be known, I can commit to the unknowing. I can dive out of my comfort zone. This is a thing I’m proclaiming to all artists everywhere: have a more explicit relationship to your body because it changes your work. BOOMERANG has changed the way I write and think. As Davis says, “it begins with movement, as a fundamental, primitive force in the world, stripped of the self-consciousness of the canon and history of dance.” Davis is full of phrases like this: “embodied life,” “kinesthetic basis,” whereas Radella is a little more succinct. (She likes “wild calm.”) They work tirelessly, and they’re premiering a new commission, Repercussion. The show features Davis and Galvin, some text by writer Lewis Hyde, and music and movement by Greg Saunier, founder and drummer of Deerhoof. Greg’s a little more like me. Not superhumanly athletic. Not particularly “dancerly.” On the three-hour car-ride back from the Watermill Center (where we were in residence developing Repercussion), Greg and I talked about the effect BOOMERANG had had on us as artists. Throughout the course of the conversation, we started to realize how similar our experience had been. We’d been compelled by seeing them perform—and then suddenly we were contributing; and then we were in the work, getting moved and tossed and tangled. Greg’s an extremely successful musician. I’m an emerging playwright. Being inside the work changed both of our processes. I’ve started noticing the way people walk. I’ve started writing movement into my plays—not abstract movement, but simple things— “he stretches wide, for longer than is normal,” or, “he drops his drink and just stares at it.” I’m still often lazy and sedentary and hedonistic, but at least I’m more aware of it now. Instead of working towards an abstract notion of success, I can let myself exist in the immediacy of the body. Instead of working tirelessly in an effort to be known, I can commit to the unknowing. I can dive out of my comfort zone. This is a thing I’m proclaiming to all artists everywhere: have a more explicit relationship to your body because it changes your work. Adrian Galvin, Greg Saunier, Matty Davis in Repercussion at The Watermill Center. Photo by Mark Davis. BOOMERANG doesn’t consider their work to be strictly dance, and I think that’s right. When I tell surprised friends that I’m part of a dance company, I always try to be more specific. It’s “movement.” No, it’s “performance art.” Ah, no, it’s “unique.” I just have to “be myself,” but it’s also “scary and athletic.” It’s “badass.” It’s “raw,” “human,” and “honest.” Recently, I’ve started thinking of another word: enlightening. I think it should be taught in schools. I really do. Not “do this, do that, know this, or know that.” But rather: You have a body. There is ground below you and air above you. You are surrounded by other bodies, with ground below them and air above them. As Radella says: “I think about and deal with the actual human beings in the work and how they move, create sound, relate to one another and to the space.” Having been one of those humans in the work, I can say that it taught me about how I move, how I create sound, how I relate to others and to the spaces I inhabit. One time early on during a run of For the toward, Radella told me to stop doing movement “just because someone told me to do it.” I started to let the movement be my own, and suddenly the piece felt right, and looked right. So maybe that’s how I’ll end: stop doing things because people told you to do them. Make the movement yours.